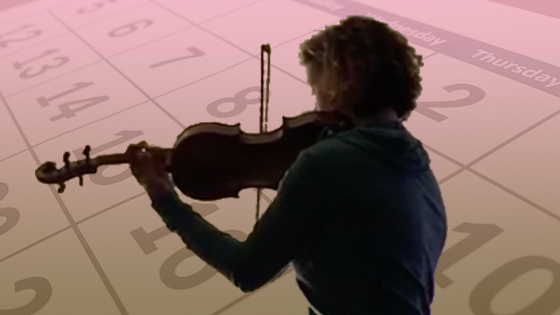 November 17, 2017, 3:32 PM · Recently Hilary Hahn drew some attention for taking a vow to practice every day for 100 days - and documenting that on Instagram. Though some thought this was no big deal for a pro violinist, I found it both commendable and inspirational. Sure, people talk about practicing, but how many truly "walk the walk" and show that level of devotion? By documenting it day-by-day, she also provided an example of what devotion looks like: it's not easy and it's not glamorous. On some days she's dressed up and exuberant, on others she is rather tired, or has to work around a bandaid on a sore finger. She also shows us that practicing for her is a lot like practicing for the rest of us: slow practice and fast practice; tedious technical work; repetition; open strings; no vibrato, yes vibrato; passage-by-passage detail work. On many days she has very fixed goals; but occasionally there is that day when it's "no pressure, no goals," just playing, or even just listening to a previous performance. Basically, it's steady work and commitment. Have you ever succeeded in practicing daily for a fixed amount of days? What is your longest stretch of daily practice? Please share your answer (choosing the longest stretch you practiced) and then also tell us about it in the comments. How many days did you go? What were the biggest challenges? Did it help your playing? Was it part of a challenge? November 17, 2017 at 11:16 PM · It depends on what counts as practice. I consider listening to a previous performance, mental practice, studying scores or reviewing performances of great violinists are all counts as practice, so my vote is two years or more. If by practice we mean deliberate practice with violin, then that's a different story. Travel, illness and other commitment would make such daily activity impossible. November 17, 2017 at 11:52 PM · I generally do not practice seven days a week, except during lessonless weeks. November 18, 2017 at 12:27 AM · I voted 100, but that was during my schooldays, when my Dad got me up every morning to practise before breakfast! I didn't vote for a longer period, because I don't think there was a year in which I wasn't sick in bed for at least a day or two. November 18, 2017 at 12:34 AM · "100 days or more" here. Not an exact amount of days, because I didn't keep a written record. But I recall practicing and playing every day from late November 2015 through well into summer 2016. Estimate: 240-285 days. The biggest challenge I recall was occasional fatigue. I work out regularly, too, and the workouts sometimes require a follow-up power-nap of about 15 minutes after I get home. Then I feel fresh for the next practice session. November 18, 2017 at 12:41 AM · When I had fewer demands on my time and was studying with my teacher, I tried to practice every day. I took it as a challenge when Laurie suggested it years ago. I was surprised to find that I didn't burn out practicing every day, and that in fact it _did_ improve my playing, as long as I practiced mindfully. Now I play viola and my intonation goes off if I don't practice regularly, so I practice as often as I can. November 18, 2017 at 02:08 AM · I practiced yesterday. November 18, 2017 at 03:42 AM · Doesn't it depend also on how much practice you're doing? I've practised every day for probably 3-4 months, but some days it wasn't a whole lot, which I'm not proud of. November 18, 2017 at 08:17 AM · I wouldn't recommend this but it seems appropriate to confess here that I haven't practised in any formal sense for nigh-on 50 years. A few years ago, though, I set myself a target of recording a complete obscure chamber work (mostly string quartets) every week for a year, playing all the parts myself with some digital assistance for the cello. In the event I managed to keep it up for 27 months. November 18, 2017 at 01:52 PM · Perhaps there should have been a further choice of "less than 7 days"? Which would include very occasional "practice" days and those violinists who don't "practice" much anyway, perhaps because they're very busy in rehearsals and gigs, including travelling. It may be argued of course that rehearsals can be a form of practice. November 18, 2017 at 04:17 PM · Are you guys seious??? I've practised virtually every single day since the age of 6, and I'm 83. I'm performing the Kabalevsky in two weeks time. I sight-read it a year ago and now have it securely from memory. By the way Laurie: practising is spelt with an s.
November 18, 2017 at 05:17 PM · How about vows to not practice too? November 18, 2017 at 08:18 PM · Lol you Brits! In America we are always "practicing," and that is how it is "spelled"! November 18, 2017 at 10:45 PM · Sorry I misread - this is about "practicing"! I've done tons of that! November 19, 2017 at 09:29 PM · In America, not only is it spelled "practicing," but the redundant phrase "two weeks' time" includes an apostrophe. November 19, 2017 at 10:22 PM · I think it is important to also note how long people practice each day. I probably wouldn’t even have practiced 7 days in a row if it where 1 hour or more. November 20, 2017 at 02:41 AM · "Practice" is a noun, "practise" is a verb (and the "-ing" version depends on this too). I agree with Gemma and Violin Master. I don't remember the last time I didn't practise, but sometimes it's as little as 30 minutes which barely counts does it? I don't think it's actually important to note how long people practice every day. Obviously, the more you practice, the better the likely progress. But daily practice is daily practice! It counts, and it also works. When it comes to daily practice, some days could be three hours, others could be 25 minutes. For someone very young, it could be even less. But there is something about that daily devotion of practicing that is extremely effective, I've seen it so many times in my 25 years of teaching. It is certainly more effective to practice every day for a half-hour than it is to practice one day for three and a half hours. Thanks for your patience with my dissident question !! 1. On occasions when I have gone days or weeks without picking up my violin, sometimes my playing has been much better. - Less stale. - A break can be good. November 21, 2017 at 02:18 AM · Heifetz frequently took Sundays off, he said. That seems like a good rule, whether you're performing on Sunday or not. Using the time to get an extra-vigorous workout, a nice walk in the sun with your family, and a few extra chapters through your latest book will make Monday's practice session even more productive. November 21, 2017 at 05:56 PM · We humans aren't computers -- we do seem to need that cycle of work and rest, thought and reflection... coffee and vodka!